ChemSee has several tests and detection kits available for detecting PETN solids and residues. Each test gives results as a simple, easy-to-understand color change. Pentaerythritol Tetranitrate (PETN) is a common high explosive used in both military and industrial settings. It is frequently mixed with a plasticizer to form Plastic Explosives. It can be mixed with RDX to form Semtex plastic explosive. PETN appears as a white, crystalline solid. The photo above shows the detection of trace residues of PETN on a surface using ChemSee’s SprayView™ Explosive Detection Kit. 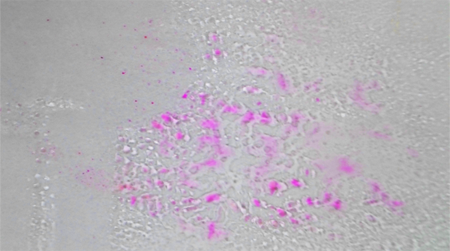 Notice that a pink/purple color forms on the suspect surface due to the presence of PETN. To detect PETN the user simply sprays the surface with Solution A, then with Solution B. 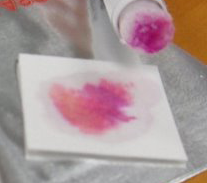 The user will then observe a pink color change if PETN or other Nitrate-Esters/Nitramines are present. This test for PETN can be completed in less than two minutes using the SprayView™ Explosive Detection Kit. The photo to the left shows detection of a PETN simulant using ChemSee’s Nitro-Pen. Notice a pink/purple color forms on the Nitro-Pen due to the presence of PETN. This test for PETN can be completed in less than three minutes using the Nitro-Pen. ChemSee’s SprayView™ Explosive Detection Kit is a convenient way to test for the presence of explosive nitrates including TNT, Nitroglycerin, PETN, RDX, HMX and Ammonium Nitrate on any surface using three solutions contained in small spray bottles. ChemSee offers several portable detection kits for explosives and explosive precursors, including PETN. All Kits contain multiple detectors for different explosives, including PETN, which is detected using the Nitro-Pen. Refill detectors are available for used Kits. ChemSee’s Nitro-Screen Kit can be used to test 140 samples for the presence of explosive nitrates including TNT, Nitroglycerin, PETN, RDX, HMX and Ammonium Nitrate. PETN is detected via a simple color change in less than one minute. ChemSee’s In-Flight Explosives Detection Kit offers simple, colorimetric detection of explosives including PETN. This Kit does not require the use of hazardous solvents or vapors which are hazardous especially in the confined space of an airplane cabin. PETN is known by several names and may be listed as: petn, pentaerythritol tetranitrate, pent, penta, ten, corpent, penthrite or C5H8N4O12. All of ChemSee’s detectors and tests for PETN use color-based detection and give results instantly. All detectors use well-known, proven chemistries for detecting Pentaerythritol Tetranitrate. will contact you shortly with additional information.